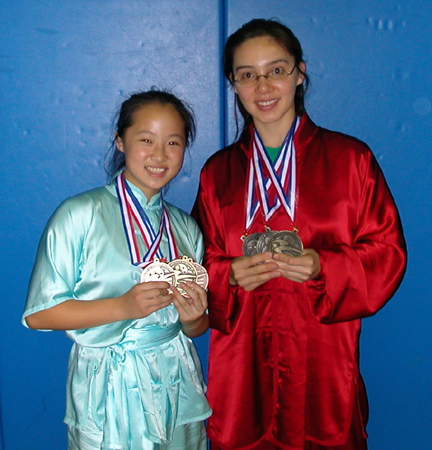 San Diegans Lui Guojing Evans and Emily Hsu captured multiple medals and a Grand Championship trophy at the recent International Wushu (Chinese Martial Arts) Festival and Championship in Annandale, Virginia. The intense athleticism and stunning beauty of Chinese Martial Arts is a result of centuries of practice and development. Long before the popular movie “The Matrix” ever had a virtual kung-fu training room, or television idol “Buffy the Vampire Slayer” learned how to throw a kick, Chinese Martial Arts was deeply ingrained as a competitive sport and healing art in Asia. In the United States, Chinese Martial Arts-oriented organizations are putting on increasingly frequent tournaments for the increasingly frequent tournaments for the large pool of practitioners. 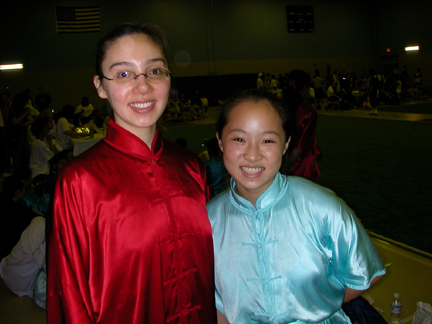 The USA Wushu Kungfu Federation, host of the recent Virginia tournament, is the largest and most official organization, and its tournament drew contestants from throughout the United States and more than 10 other countries. Lui Guojing, 23, swept the Taiji (Tai Chi) divisions, winning six gold and two silver medals, and her eighth Grand Championship Cup. Taiji is a slow, graceful art that has been gaining popularity across the country for its meditative aspect and considerable health benefits. “Jing Jing”, as the San Carlos resident is known, has been studying Taiji from her mother for the past ten years, and demonstrated the strong rhythmic, aesthetic, and martial components of the seemingly “soft” art. Emily, 12, won two gold medals and one bronze in this, her first big USAWKF tournament. The young North County native competed in the physically intensive Youth Kung-fu / Wushu divisions, where she demonstrated her speed, skill, and acrobatic ability in bare-hand, sword, and staff forms. Lui Guojing and Emily were the only representatives of San Diego at the international tournament. Lui Guojing and her mother-coach, Siu-Fong, opened the JING Institute of Chinese Martial Arts and Culture in the Miramar area a year and a half ago. Emily has been studying at JING for the past six months. The relatively new studio, which offers class in Kung-fu/Wushu, Taiji, Wing Chun, Movie Fighting, and Chinese Language, has already grown into a resource for all Southern Californians interested in health, beauty, and culture, the Chinese way!